By definition, ‘motor development’ or ‘psychomotor development’ relates to a higher cognitive process and one’s improved function of body movements. Movements that include the flexion of the tongue, lips, arms and legs. It also refers to one’s ability to bend, flex and rotate the torso. 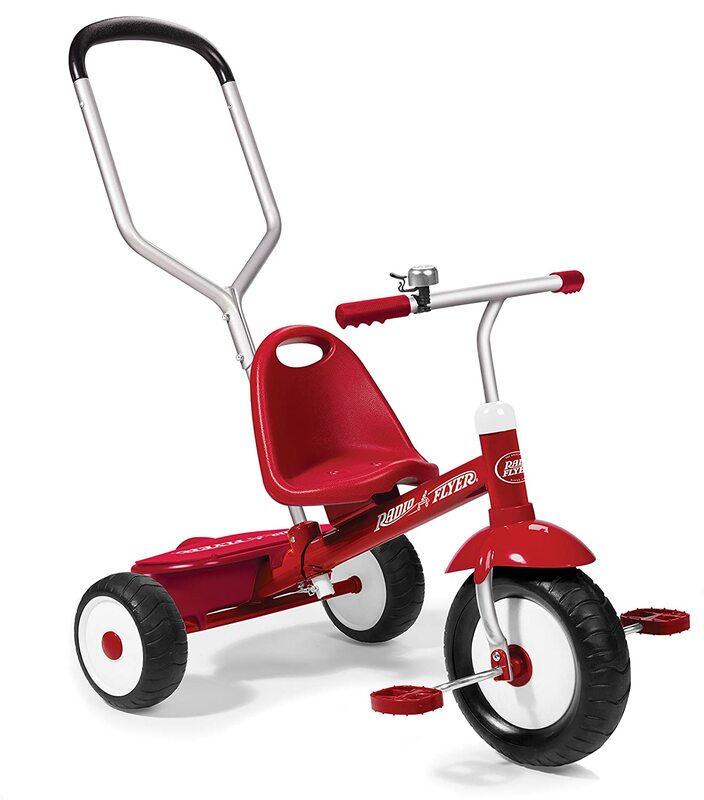 Note: Price $69.99 (+ Shipping / Price subject to change by Amazon) Radio Flyer Deluxe Steer and Stroll Trike, by Radio Flyer. Reflex movements of muscle groups are automatic, involuntary and are stimulated by external environmental conditions. Noticeably, these reflexes can be observed within the first twelve months as ‘Survival,’ ‘Loco-motor,’ ‘Postural’ reflexes. Survival reflexes are innate muscle movements designed to protect infants in the early stages of life, it also refers to ‘eye-blinking’ for eye protection and the self-preservation of ‘sucking’ and ‘swallowing’ for the consumption of food. Conversely, Postural, Loco-motor reflexes are movements later on in the developmental stage. These movements include the ‘Babinski,’ ‘Moro,’ ‘Palmar grasp,’ ‘Swimming,’ and ‘Osymmetrical tonic neck’ reflexes. Let’s now look at each reflex in more detail. The Babinski reflex is observable after stroking the sole of the infant’s foot from heel to toe. Noticeably, this stimulation results in the infant’s foot turning inwards while the toes fan outward. In contrast, the ‘Moro’ or ‘Startled’ reflex refers to the arching of the infant’s back with arms displayed outwards and is normally stimulated by loud noises. Furthermore, the infant will return to the original natural position after the initial startle. The Palmar grasp is another reflex that is not noticeable during the first 3 to 4 months after birth and is stimulated when objects are placed within the palm of the infant’s hand. The infant, therefore, responds by grasping the object to such an extent that it’s possible for the infant to support its own weight. In addition, the ‘Swimming’ reflex relates to coordinated kicking or paddle movements after the infant is placed face down in a body of water. Noticeably, ‘Stepping’ is another coordinated reflex movement and is stimulated when their bare feet are able to touch a flat surface while being held upright. The last reflex, the ‘Asymmetrical tonic’ neck reflex is present up until 6 months and is self-evident when the infant extends the arm in the direction that he or she is looking in. Voluntary movements Neurophysiological changes within the first 2 years of life is referred to by Gesell & McGraw as a form of ‘maturation’ as it accounts for why reflexes are replaced by voluntary movements. This chronological period is also termed ‘the rudimentary movement phase’ by psychoanalyst Gabbard (2004) and is considered to be a predictable developmental stage. Moreover, Gallahue & Ozman (2005) argued that one’s capacity to develop voluntary movements is subject to the individual’s developmental experiences. Furthermore, how these rudimentary voluntary movements also developed for survival purposes. Therefore, voluntary manipulative movements like grasping, releasing, crawling and walking are considered to be innate instinctual phases of development. O’Brien and Hayes (1995) suggested that this phase or ‘between task movement sequences’ is a representation of the transition between one’s reflex-based movements and one’s cognitive ability to control movements. In addition, the refinement of voluntary movements can be expressed as the individual’s ability to have greater control over one’s dynamic balance, limbs and body. It’s also between the age of two and six years of age when the child’s environment plays a role in sequence movement development. Such movements include walking, jumping and kicking. Noticeably, dynamic balance is established and refined between 2 and 6 years of age. With this in mind, we can compare the awkward wide-legged spatial gate of a two-year-old and a five-year-old’s coordinated ability to run. Therefore, knowledge of this refined motor sequences or the integration of coordinated movements is significantly improved by the child reaches six years of age. It’s also at this chronological stage of development when the child’s movements become automatic, that anticipation and interception of moving objects occurs as the child’s physical, perceptual and neurological maturation develops. These milestones of mastery are also noticeable as the child transitions between childhood and adolescence. It also relates to a child’s ability to interact and develop within their environment by implementing habitual behavioural patterns that are socially acceptable. Furthermore, gross and fine motor developmental milestones within the first two years are normally measured in months. Here are a few examples of these milestones. A child’s ability to ‘grasp’ a rattle occurs around 3 months, noticeably, this is in contrast to a five-month-old who is capable of standing while holding onto furniture. Moreover, when a child reaches twelve months they would have acquired the necessary motor skills to build a tower with two cubes. In addition, late childhood into adolescence refers to the chronological period between 7 and 17 years of age, it also accounts for many significant improvements in one’s gross-motor skills, physiology and neurological development, like muscle mass, strength and one’s increased cardio-respiratory capacity. Adolescence also includes the biological development or pubescent growth period between 12 and 15 years of age. Noticeably, Gabbard (2004) argued that there is a correlation between one’s physical attributes and one’s improved gross motor-skills. This is evident in Gabbard’s view as the male’s respiratory volume, strength, muscle and bone mass is proportionally larger in comparison to females during the same chronological developmental stage. Moreover, how the elongation of limbs and muscle mass also provides greater rotational torque for males. Noticeably, Gabbard referred to these differences in males as a way of explaining how males initially have a significant quantitative advantage in the development of gross motor skills. With this in mind, the gap between a males ability to sprint, jump and run might be greater initially until the female body matures. In addition, Gabbard (2004) estimated that one’s neuromuscular response time and peak physical performance is reached, on average, by the time a person reaches 30 years of age. Moreover, that one’s muscle mass declines by 25 and 30 per cent between 30 and 70 years of age respectively. It also accounts for one variable in Gabbard’s view of why individuals decline in neuromuscular motor control. This is noticeable with age according to Ketcham & Stelmach (2001) as older individuals adopt a smaller walking gate and slower gross-motor movements as their sensory integration, that is, their perception and cognitive ability to maintain hand-eye coordination declines. This also occurs in Gabbard’s opinion as a result of muscle stiffness and the body’s inability to maintain flexibility. In Gesell & Thomson’s (1929) view, the acquisition of fine and gross motor skills can be attributed to one’s opportunities to practice such skills within one’s environment. They also interpreted by the observation of twin studies that individuals, namely, children develop according to a genetically programmed timetable. Moreover, that one’s chronological disposition plays a significant role in the development of new skills. With this in mind, Michael Rutter’s (2004) observation of infants within orphanages had yielded the following results, that sensory deprivation is associated with the impairment of motor development, furthermore, that social isolation deprives the infant the opportunity to practice movement. Moreover, cross-cultural studies by W. Dennis & M. G. Dennis (1940) had identified motor retardation within Hopi Indian children as a result of being bound to a ‘cradleboard’ for the first few months of life. However, unlike the orphans as previously mentioned, the Hopi Indian mothers carried their children around with them. Noticeably, this resulted in the child being socially stimulated and their motor skills were found not to be as impaired. Transversely, Hopkin’s (1991) observation of Jamaican mothers and their child-rearing practices had identified stimulation, that is, the gentle massage and stretching of the infant’s limbs had resulted in improved motor development. Therefore, knowledge of this sensory deprivation can be seen as having an adverse effect on a child’s motor skills. Conversely, the opposite can also be acknowledged, that early stimulation during the developmental stage is beneficial to a child’s social and improved motor development. Moreover, as identified by Thelen (1998) a child’s development is based on ‘maturation’ and is orientated around solving environmental tasks. With this in mind, a child’s ability to resolve task-based activities is limited to the child’s loco-motor and neuromuscular development. One such stage of maturation according to Thelen occurs when a child’s mobility, namely, how crawling and walking allows the child to fulfil certain tasks, like being able to crawl or walk towards a desirable object. In addition, Thelen noted that some infants skip the crawling stage altogether as they subscribe to ‘scooting’ as a form of mobility. Noticeably, in Thelen’s scooting of the infant’s bum across a surface allows the child the opportunity to implement arm movements to resolve a task. Moreover, that scooting doesn’t infer or impact on the child’s ability to walk later on in life. Furthermore, Thelen (1985) conceptualised that loco-motor development might be determined by the degree in which ‘joint-coupling’ is implemented by the infant during the early stages of maturation. In other words, how one joint movement might be correlated with the development of another joint movement, namely, the hip, knee and ankle when the child is kicking? Thelen’s research revealed that ‘tight-coupling’ occurs during the first four months of life before ‘transient coupling’ takes place. Noticeably, Thelen attributed these two developmental phases to joint coupling and the dissociation of joint coupling to perform independent voluntary muscle movements to resolve certain tasks. Knowing of this we can identify the infant’s rhythmical movement of kicking as joint-coupling and the isolated independent muscle movement of climbing as uncoupling. Sensory-neurological processes & motor development. The hierarchical progressive nature of development infers an increase in one’s physical, cognitive and sensory neurological processes. Moreover, neurological behaviourist O’Brien & Hay’s (1995) identified these underlying processes as influential factors of one’s motor development. That one’s sensory-neurological and integrated perceptual processes allows the individual to transition from simple movements to advanced complex controlled motor skills. For example; how perception via vision plays a major role in executing complex motor tasks like predicting the flight path of a ball. balance, and is different to the kinesthetic system of receptors found within muscles, tendons and joints that enable us to coordinate muscle movement. Therefore, sensory systems like vision and proprioceptors are critical to one’s motor development according to O’Brien & Hays (1995). Neisser (1967) conceptualised that cognition develops as one’s sensory information is stored, retrieved, reduced, elaborated, transformed and implemented by the individual. Noticeably, this is in contrast to the Piagetian theory which refers to one’s perceptual motor development refers to one’s acquired knowledge and how this knowledge affects one’s behavioural patterns. In addition, other developmental researchers like Laszle & Bairstow (1985) had identified ‘memory,’ ‘anticipation’ and the ‘prediction’ of events as elements to one’s ability to perform motor task skills. Noticeably, sports like table tennis reflect one’s ability to remember, anticipate and predict the flight path of a ball. In addition, Diamond (2000) conceptualised that one’s motor development is related to one’s cognition via the cerebella and prefrontal cortex development, as cognition plays a vital role in the development of one’s motor function. With this in mind, a person’s conscious cognitive ability to monitor, evaluate, plan and revise the predicted flight path of a ball is referred to one’s ‘higher order’ or ‘metacognitive’ mental process. Noticeably, metacognition is different from ‘Executive functioning’ as the latter relates to acts of self-control and goal-directed behaviour. Therefore, according to Dempster (1992) executive functioning refers to one’s inhibition of mental attention, that is, one’s ability to interrupt or prevent a well-established response. It also accounts for in Dempster’s view why individuals have ‘attention deficit hyperactivity disorder’ or ‘ADHD’ as their executive mental function is unable to moderate or regulate the individual’s visual, spatial memory. Motor behaviour, therefore, is a reflection of a child’s cognitive development. As a member of society, a child’s motor development is directly affected by the child’s personal environmental experiences and how often a task is repeated or imitated within their own culture. Noticeably, this premise also accounts for one’s development of personal characteristics. With this in mind, a child’s fine, gross motor skills can be significantly improved as a result of a child’s physical and social interaction within team sports. Knowing of this, physical education within the education system is beneficial in a child’s self-perception of physical ability to develop on both a physical and social level, as a child’s self-perception of physical ability is correlated with the child’s level of self-esteem according to Skinner (2001). Conversely, the opposite can also be true, that a child’s low level of self-esteem can be reflected in the child’s social and emotional functioning. Moreover, in Kanioglou, Tsorbatzoudis & Barkoukis’s (2005) view rejection by a child’s sporting peers can influence and retard a child’s social and motor development. Furthermore, Rose et al. (1998) identified gender as a social influential factor in one’s development as females from birth seek out a safe sporting environment. However, according to Figler & Whitaker (1999), this social separation decreases as a female’s body develops physically. In addition, research was undertaken by Larkin & Houre (1991) linked a child’s lack of coordination with lower aerobic levels of fitness. Noticeably, their results also indicated lower levels of muscular endurance, strength and flexibility. Therefore, as a result, ‘clumsy’ ‘uncoordinated’ children were observed as being more endomorphic in physical appearance. Moreover, in Colditz, Dietz, Gormaker, Must, Sobol and Peterson’s view, children between 15 years of age are at greater risk of becoming obese if they spend more time in front of the television. This conclusion also reinforces the Australian Governments Department of Health and Ageing recommendations (2005) that children should spend no less than 1 hour of moderate to vigorous physical activity per day. The report also indicated that children should not engage in computer/TV activities for more than two hours a day. Hi Alex, I think you have done your homework! You have great advice for new parents, I’m sure. I think your pages are great and very informative. I wish you the best getting all your work on this topic the best of luck! Looks good to me. Thanks Teresa for your kind words and if you need any help on the above topics, then please reach out and say hi. As you would imagine, working from home can allow you to be more…. Financially Independent with Flexible Working Hours. Moreover, the WA platform also allows you to have more time at home with your Family. Contact Us: alex-monroe@new-parents.com Blossom Feminine by Blossom Themes. Powered by WordPress .